“I wish we'd never seen these drugs,” said renowned orthopedic surgeon Dr. Larry Bramlage at the conclusion of a recent presentation about bisphosphonates. Four years after the Food and Drug Administration approved the use of Tildren and Osphos (both trade names for bisphosphonates) for use in adult horses suffering from navicular syndrome, Bramlage said he's seeing unintended side effects from people using the drug off label. As Bramlage explained at a recent client education seminar held by Rood and Riddle Equine Hospital, there are three main types of cells associated with bone repair and growth: osteoblasts, which make new bone; osteoclasts, which break down damaged or inferior bone, and osteocytes, which direct the repair. When a horse has a fracture, the crack is initially filled by the osteoblasts with a temporary boney substance called woven bone, which can be made very quickly but is not very strong. Over time, osteoclasts clear away woven bone, which is poorly organized and weak, allowing osteoblasts to lay down the better organized and stronger lamellar bone. The lamellar bone fills in the crack and makes the bone whole again, both practically and on radiograph. Bones are constantly breaking down and building back up in response to normal wear and tear and training. Bisphosphonates work by poisoning osteoclasts and for this reason are used to slow osteoporosis in people. They also have an analgesic effect, which is why they are used in human bone tumor patients. This is also why they are presented as an option for horses dealing with painful and hard-to-pinpoint inflammation due to navicular syndrome. Bramlage is finding bisphosphonates' mechanism of action also disrupts the natural healing process in young horses during training. Bramlage is seeing stunted healing on radiographs of horses who have had surgery or rest to repair fractures which normally would have improved in a couple of months. Sometimes as much as 14 months after injury, the x-rays still show the injuries that have been “patched up” with woven bone still persist with original fractures visible. Bisphosphonates don't stop horses from making new bone, which Bramlage says is the reason the drugs don't seem to be causing fractures. They do stop osteoclasts from clearing the weak woven bone out of the way of osteoblasts putting in the strong stuff. The radiographs show new layers of bone being added over cracks but not remodeling of the fractures themselves. As a result, a horse's bone gets denser on the radiographs because of the added woven bone but it doesn't get stronger or repair. Bramlage said the drug does nothing to prompt osteoblasts to work harder as some have theorized, so it doesn't speed this layering process, either. This mechanism doesn't raise the same problems in pleasure horses because their bones aren't subjected to the volume of stress and rapid need for repair. Bisphosphonates can cause problems healing bones in humans, too. Bramlage recently spoke to several human surgeons about patients who are unlucky enough to break a bone after they've been on bisphosphonates to prevent osteoporosis. All of this seems to Bramlage like a poor trade-off for a pain-relieving effect that probably wears off in about 30 days. (Bisphosphonates are shown to attach to the bone's surface after administration and persist for years even after just one dose. Repeated doses cause cumulative levels on the interior surfaces of the bones.) 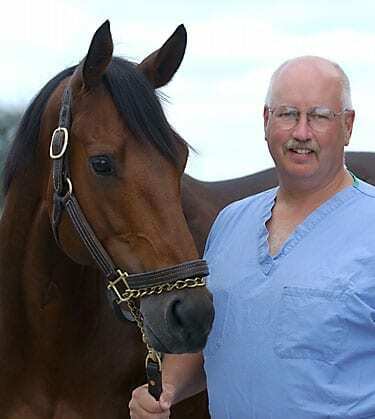 Bramlage said it's important to note that because of the drug's long life on bone surfaces, a trainer currently in possession of a horse may not be the one who originally gave the horse bisphosphonates and may not even know the horse has been exposed to the drug. The issues Bramlage is seeing are in horses that have been given bisphosphonates outside manufacturer guidelines. The guidelines state the drugs should not be administered to horses under the age of five. A quick look at the drug literature will make the intended use clear. Bisphosphonates became a concern for racing regulators in 2015 when the Kentucky Equine Drug Research Council announced its intent to study the drugs after receiving information some managers and trainers could be using it for its analgesic effect. In England, the British Horseracing Authority issued a mandatory 30-day stand-down period for horses receiving bisphosphonates and prohibits their use in horses less than 3 1/2 years of age. Unfortunately, the drug is difficult to test for and Bramlage worries the temptation of general analgesia can prove too much for some horsemen. This entry was posted in Horse Care, NL List and tagged bisphosphonates, Dr. Larry Bramlage, fracture repair in horses, Kentucky Equine Drug Research Council, Rood and Riddle Equine Hospital by Natalie Voss. Bookmark the permalink.